The next photo shows the joints arranged at a 30 degree angle to each other to form a diamond pattern. From this pattern more complicated designs known as “mitsukude” can be made. 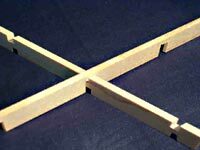 This process involves using two identical pieces of wood that are joined (see corresponding photo). These are then joined to a third piece (next photo) creating the design known as “mitsukude”. 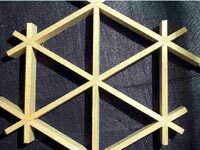 In this way, several equilateral triangular pieces can be joined together to form a hexagonal-shaped skeleton framework. 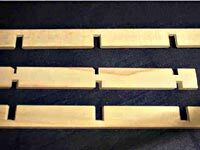 In order to form identical equilateral triangular shapes which will form the basis for more complicated patterns, the original wooden slats must be precision manufactured to a thickness accurate within 0.01mm. 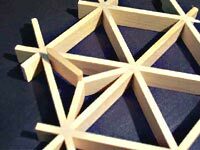 Once the triangular shapes are completed, smaller wooden pieces can be arranged within them to create “leaves”. The leaves can be arranged in a variety of ways to form a wide arrangement of patterns, designs and expressions. The photo at left shows a pattern called a “hemp leaf”. This pattern is used not only in kumiko but with kimonos, “furoshiki” (Japanese wrapping cloth) and “washi” (Japanese paper) and others. 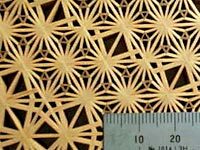 It is a design characteristic of the Japanese style and forms the basis for kumiko design patterns. Designs incorporating small, intricate types of “mitsukude” and “leaves” demand a high level of craftsmanship. The goal of the craftsman who made the kumiko design in the photo at left (known as “kawari asa”) was to fit as many leaf patterns as possible into a triangular framework. For this he was awarded a prize at the national competition. The smallest part of this pattern is 0.4mm thick and 2.5mm long.